I routinely grouse about the heavy economic cost of red tape. I’ve also highlighted agencies (such as the EEOC) that seem especially prone to senseless regulations. And I’ve explained why private regulation actually is a very effective way of promoting health and safety. Today, let’s get specific and look at the Food and Drug Administration. This bureaucracy ostensibly is supposed to protect us by making sure drugs and medical devices are safe and effective before getting approval, which seems like it might be a reasonable role for government. But the FDA routinely does really foolish things that undermine public health. The likely reason is that the bureaucracy has a bad incentive structure. As Professor Alex Tabarrok has explained. …the FDA has an incentive to delay the introduction of new drugs because approving a bad drug (Type I error) has more severe consequences for the FDA than does failing to approve a good drug (Type II error). In the former case at least some victims are identifiable and the New York Times writes stories about them and how they died because the FDA failed. In the latter case, when the FDA fails to approve a good drug, people die but the bodies are buried in an invisible graveyard. This video from Learn Liberty looks at some data on how the FDA’s Type II errors have led to thousands of deaths, but mostly focuses on whether people and medical professionals should have the freedom to makes choices different from what the FDA has officially blessed. It’s also worth mentioning that the process of drug approval is jaw-droppingly expensive, as Professor Tabarrok noted in another column. It costs well over a billion dollars to get the average new drug approved and much of that cost comes from FDA required clinical trials. Longer and larger clinical trials mean that the drugs that are eventually approved are safer. But longer trials also mean that good drugs are delayed. And the more expensive it is to produce new drugs the fewer new drugs will be produced. In short, longer and larger trials mean drug delay and drug loss. The FDA bureaucracy can’t even approve things it already has approved. There was a big controversy a few months ago about the EpiPen, which is a very expensive device that auto-injects medication to people suffering severe allergic reactions. But the device is only costly because the FDA is hindering competition, as noted by the Wall Street Journal. Epinephrine is a basic and super-cheap medicine, and the EpiPen auto-injector device has been around since the 1970s. Thus EpiPen should be open to generic competition, which cuts prices dramatically for most other old medicines. Competitors have been trying for years to challenge Mylan’s EpiPen franchise with low-cost alternatives—only to become entangled in the Food and Drug Administration’s regulatory afflatus. …the FDA maintains no clear and consistent principles for generic drug-delivery devices like auto injectors or asthma inhalers. …injecting a kid in anaphylactic shock with epinephrine…is not complex medical engineering. But no company has been able to do so to the FDA’s satisfaction. Research from the Mercatus Center reveals that the FDA imposes ever-higher costs and gets ever-higher budgets, but also how the bureaucracy fails to deliver on its obligation to facilitate innovation. The expense of putting drugs and devices through this system is almost unimaginable. The cost of bringing low- to medium-risk 510(k) medical devices to market averages $31 million, $24 million (75 percent) of which is dedicated solely to attaining FDA approval within an average of about six months. Any significant improvement to the device requires reapplication. For higher-risk medical devices where there may be significant health gains, the costs are about $94 million, $75 million (80 percent) of which is dedicated to attaining FDA approval. For drugs, the situation is much worse. It costs an average of $2.6 billion simply to get a drug through the FDA process and onto the market. This does not include postmarket monitoring, the terms of which are laid out by FDA upon approval. These costs have increased from about $1 billion between 1983 and 1994. 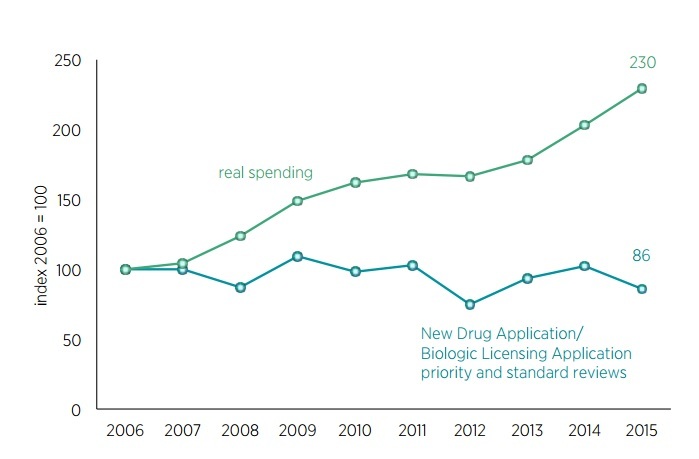 …we continue to increase the funding and authority for FDA and assume that we will somehow boost innovation in medical products (drugs and devices) despite the growing obstacles. This has not happened. …Congress continues to increase funding for FDA through both the general fund and industry user fees…with the hope that performance goals and additional funding would increase FDA’s performance and lead to an increase in innovations. …but FDA finds strategic ways to narrowly meet each goal while frustrating the original goal of improving health outcomes through innovation. By the way, the FDA also does really bone-headed things. I’ve previously written about the bureaucracy’s war against unpasteurized milk (including military-style raids on dairies!). Now the bureaucrats think soldiers shouldn’t be allowed to get cigars. The Wall Street Journal has the details of this silly nanny-state intervention. You might think GIs in Iraq and Afghanistan have enough to worry about with Islamic State and the Taliban. But it turns out they’ve also got a problem called the Food and Drug Administration. In August a new FDA rule went into effect that forbids tobacco makers and distributors from handing out free samples. Some companies that have been donating cigars to service members for decades have now stopped for fear that this is now illegal. The FDA nuttiness has attracted the attention of Rep. Kathy Castor, a Democrat who represents Florida’s 14th district, which includes “Cigar City,” or Tampa. She has introduced a bill to “reinstate the tradition of donating cigars to our military members to provide them with a taste of home while deployed.” Her press release notes that cigars are the “second-most requested item” from troops overseas. …cigars for service members is in question because it’s a proxy for the political war on tobacco, but the first casualty is common sense. The FDA’s bureaucrats are happy to have U.S. soldiers, sailors, airmen and Marines dodge bullets overseas but they’re horrified they might relax by lighting up a stogie. But the nanny-state war against soldiers enjoying cigars is downright trivial compared to the deadly impact of the FDA’s attack on vaping. Jacob Sullum of Reason outlines some of the horrifying details. The Food and Drug Administration’s e-cigarette regulations, which took effect last week, immediately struck two blows against public health. As of Monday, companies that sell vaping equipment and the fluids that fill them are forbidden to share potentially lifesaving information about those products with their customers. They are also forbidden to make their products safer, more convenient, or more pleasant to use. The FDA’s censorship and its ban on innovation will discourage smokers from switching to vaping, even though that switch would dramatically reduce the health risks they face. That effect will be compounded by the FDA’s requirement that manufacturers obtain its approval for any vaping products they want to keep on the market for longer than two years. The cost of meeting that requirement will force many companies out of business… All of this is unambiguously bad for consumers and bad for public health. Yet the FDA took none of it into account…the Family Smoking Prevention and Tobacco Control Act…gave the FDA authority over tobacco products, a category to which it has arbitrarily assigned tobacco-free e-cigarettes, even when they contain nicotine that is not derived from tobacco or no nicotine at all. …A brief that 16 advocates of tobacco harm reduction filed last week in support of Nicopure’s lawsuit notes that the cost of the FDA’s regulations will far outweigh their benefit if they cause even a small percentage of vapers to start smoking again or deter even a small percentage of current smokers from switching. That’s because of the huge difference in risk between e-cigarettes and the conventional kind (at least 95 percent, according to the Royal College of Physicians)… The FDA acknowledges that its regulations might also harm public health by retarding the substitution of vaping for smoking. But it does not include that cost in its analysis, deeming it too speculative. The FDA literally assigns zero value to the lives of smokers who would have quit were it not for the agency’s heavy-handed meddling. Oh, I suppose I also should mention that FDA red tape is responsible for the fact that Americans have a much more limited selection of condoms than Europeans. I’m sure there’s a good joke to be made about the bureaucrats screwing us in ways that interfere with us…um…well, you know. Let’s wrap up with some tiny bits of good news. First, Arizona’s Goldwater Institute has been remarkably successful in getting states to adopt “Right to Try” laws that give seriously ill people the right to try investigational medications. Sadly, those laws will have limited use until there’s also reform in Washington. Fortunately, there’s some movement. Here’s a video from a congressional hearing organized by Senator Johnson of Wisconsin. Here’s a second item that sort of counts as good news. If there is one silver lining to the dark cloud of FDA incompetence, it’s that the bureaucrats haven’t figured out how to criminalize those who use drugs for “off-label” purposes (i.e., for reasons other than what was approved by the government). A good example, as reported by the New York Times, is a tooth desnsitizer that’s only been recently approved by the FDA (after being available for decades in nations such as Japan), and already dentists are using it to fight cavities. Since I’m not familiar with the history of the FDA, I wonder whether the bureaucrats have ever tried to block medical professionals from using drugs and devices for “off-label” purposes. Let me close with one final point. Our leftist friends aren’t very interested in reforming the FDA. Instead, they argue that the big problem is greedy pharmaceutical companies and suggest European-style price controls. That could save consumers money in the short run, I’m sure, but it would gut the incentive to develop new medications. One expert looked at the Rand Corporation estimates that such policies would lead to a decline in life expectancy of 0.7 years by 2016. He then crunched the numbers and concluded that the aggregate impact would be worse thing to ever happen. Even worse than the brutality of Mao’s China. …let me put this in context. In 2060 there will probably be 420 million Americans and 523 million Europeans. And suppose that whatever changes we make in drug regulations today last for one human lifespan, so that everybody has a chance to be 55-60. So about a billion people each losing about 0.7 years of their life equals 700 million life-years. Since some people live in countries outside the US and Europe  and they also benefit from First-World-invented medications, let’s round this up to about a billion life-years lost. What was the worst thing that ever happened? One strong contender is Mao’s Great Leap Forward, in which ineffective agricultural reforms and very effective purges killed 45 million people. Most of these people were probably already adults, and lifespan in Mao’s China wasn’t too high, so let’s say that each death from the Great Leap Forward cost what would otherwise be twenty healthy life years. In that case, the worst thing that has ever happened until now cost 45 million * 20 = 900 million life-years. Once again, RAND’s calculations plus my own Fermi estimate suggest that prescription drug price regulation would cost one billion life-years, which would very slightly edge out Communist China for the title of Worst Thing Ever. I guess the bottom line is that the FDA is a typical regulatory agency, both incompetent and expensive. But if the statists have their way, things could get a lot worse. P.S. While the regulatory burden in the United States is stifling and there are some really inane examples of silly rules such as the FDA’s war on vaping, I think Greece and Japan win the record if you want to identify the most absurd specific examples of red tape. P.P.S. Here’s what would happen if Noah tried to comply with today’s level of red tape when building an ark. And here’s some clever anti-libertarian humor about deregulated breakfast cereal. P.P.P.S. Just in case you think regulation is “merely” a cost imposed on businesses, hopefully today’s column drives home that red tape can have terrible consequences for human health. And don’t forget that bureaucratic red tape is the reason we’re now forced to use inferior light bulbs, substandard toilets, second-rate dishwashers, and inadequate washing machines. I’m very happy that we don’t have a one-world government, but my views have nothing to do with conspiratorial fears involving blue helmets and black helicopters. Instead, I’m happy that there are lots of independent nations because that means lots of different approaches to public policy. And that means we have lots of real-life experiments about the relative merits of big government vs small government. And this brings me joy because the evidence overwhelmingly shows that you get much better results when the size and scope of government is constrained. Just compare France and Switzerland. Or look at the wreckage of communism. Or consider the prosperity of Hong Kong and Singapore. Heck, I’ve put together all sorts of long-run comparisons to show that free markets produce much better results than statism. This is also why I like federalism inside a nation. I think this decentralized approach leads to better policy, as we can see from Switzerland. But it also means I have another set of real-life experiments about public policy. And, once again, this brings a smile to my face because the data clearly show the negative consequences of big government. It’s especially amusing to compare California and Texas. The Golden State is a playground for statist policies, including the highest income tax in the nation. The Lone Star State, by contrast, is famous for its laissez-faire approach and it doesn’t have any income tax. And if you look at income data, we have very clear evidence that living standards are climbing much faster in Texas, particularly for the middle class. I’m certainly not the only person to notice that there’s a clear link between good policy and good results. Writing for Investor’s Business Daily, Vance Ginn of the Texas Public Policy Foundation compares Texas and California. He starts by noting that the Lone Star State and the Golden State share some common characteristics. Texas and California…contribute 25% of U.S. economic output, have similar abundances of natural resources, and are where 20% of Americans reside. But that’s where the similarity ends. California almost surely wins the battle for which state has the best climate and scenery, but Texas is way ahead when you measure economic freedom. Texas has low taxes, no personal income tax, and less regulation, versus California’s high taxes, highest marginal personal income tax rate nationwide, and burdensome regulations. The Economic Freedom of North America report…ranks Texas as the third most free state and California as second worst. The Tax Foundation ranks Texas as having the 14th best business tax climate while California ranks third worst. Vance then addresses the left-wing stereotype that Texas is a poverty-stricken backwater. He looks at various measures and finds that Texas always comes out on top. There’s more poverty in California. What about poverty? Taking the average over the 2013 to 2015 period, the Census Bureau provides the official poverty rate of 16.1% in Texas and 15% in California, which suggests that the critics are right. However, that rate doesn’t account for regional differences in housing costs or noncash government assistance. The supplemental poverty rate includes these factors and instead finds a rate of 14.9% in Texas while California has the highest rate nationwide at 20.6%. But there’s more income in Texas. What about real income? Average nominal median household income from 2010 to 2014 (in 2014 dollars) in California ($61,489) is 17% higher and nationwide ($53,482) is 1.7% higher than in Texas ($52,576). But, the Bureau of Economic Analysis’ regional price parities data for 2014 show that the cost of living for California is 17% higher and the U.S. average is 3.5% higher than in Texas. 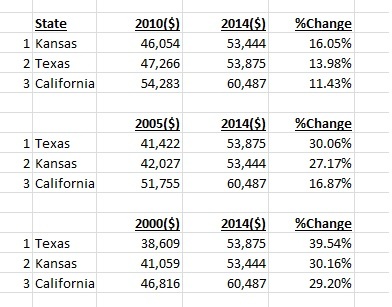 Therefore, real income in Texas purchases as much as in California and even more when you consider that Texas doesn’t have a personal income tax. Vance then points out that there is more income inequality in California, which I generally think is an irrelevant measure. In this case, though, it probably does matter because bad policy is causing disproportionate harm for the poor and middle class in California. The column also looks at the jobs data (which will cause special angst for Paul Krugman). In the last decade, Texas has been the economic and job creation engine as the real private sector expanded 29% in Texas compared with only 14% in California. Moreover, total civilian employment increased 1.2 million in California but 1.7 million in Texas, with a labor force two-thirds the size of California’s. This increase in Texas’ employment accounts for nearly one-third of all jobs created nationwide. Vance closes his column with some very appropriate advice for the incoming Trump Administration. The more you tax and regulate something, the less you get of it. Clearly, less government contributes to higher standards of living in Texas. 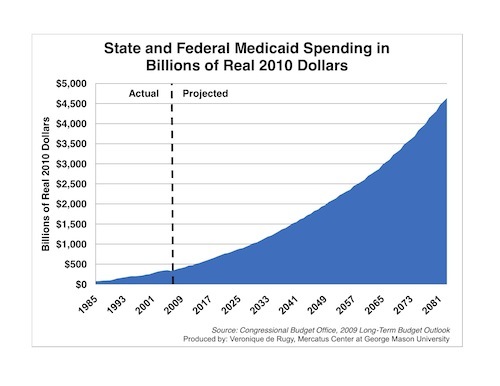 …As the new administration and policymakers nationwide reassess which direction to take, it’s important to remember that spending is the disease and taxes are a function of that disease. Restraining spending growth while following the Texas model of free market capitalism would be an excellent way to get the economy, and personal finances, back on track. None of this means policy is perfect in Texas, needless to say. There are several ways that policy could be improved. But if you’re looking for general lessons about the relative merits of big government vs. small government, both Texas and California are role models. They teach us lessons about job creation. About business climate. About government efficiency. And about labor mobility. And the lesson is always the same: You get better results when government is smaller and less intrusive. Last but not least, there’s even a very amusing joke about California, Texas, and a coyote. What’s Responsible for Ever-Growing Government, Entitlements or Defense? When I give speeches on fiscal policy, I commonly get some variation of this question (and you can choose one of more of the options). Isn’t our fiscal problem largely the result of the wars/intervention/Iraq/Afghanistan/Libya/Syria launched by Bush/Hillary/neocons/Blackwater/Pentagon? I generally respond by first confessing my lack of expertise on military and foreign affairs, but then I point out that I’m not a fan of nation building (see George Will and Mark Steyn on this topic), so I tell people that I’m very sympathetic to the proposition that trillions of dollars that have been misspent on foreign adventurism this century. Not to mention the human cost of dead and wounded American soldiers. But I then tell audiences that the Pentagon is not the reason why we’re in fiscal trouble. Let’s look at two charts, both derived from the Office and Management and Budget’s historical data. First, here are two pie charts based on the spreadsheet in Table 4.2, which looks at how much of the budget is consumed by different agencies and departments. For both 1962 and 2016, I added together outlays for the Department of Defense and Department of Veterans Affairs and compared that military-related spending to other major categories. As you can see, military-related outlays used to account for more than one-half of the federal budget, but not they are less than one-fourth of total spending in Washington. Notice, by the way, that Social Security spending now consumes a significantly larger share of the federal budget, as does spending by the Treasury Department (I assume much of that is EITC redistribution). But the biggest change, by far, is that the Department of Health and Human Services used to account for 3 percent of federal outlays, but now eats up 28 percent of the budget. Why? Because of programs such as Medicare, Medicaid, and Obamacare. By the way, the above numbers do not mean that the military budget has been cut. Here’s our second chart, which is based on the spreadsheet in Table 8.2, which has the numbers for inflation-adjusted outlays for major budget categories. As you can see, the federal government is spending more today on defense than it was back in the 1960s, even after adjusting for inflation. And outlays for “domestic discretionary” programs also have increased. 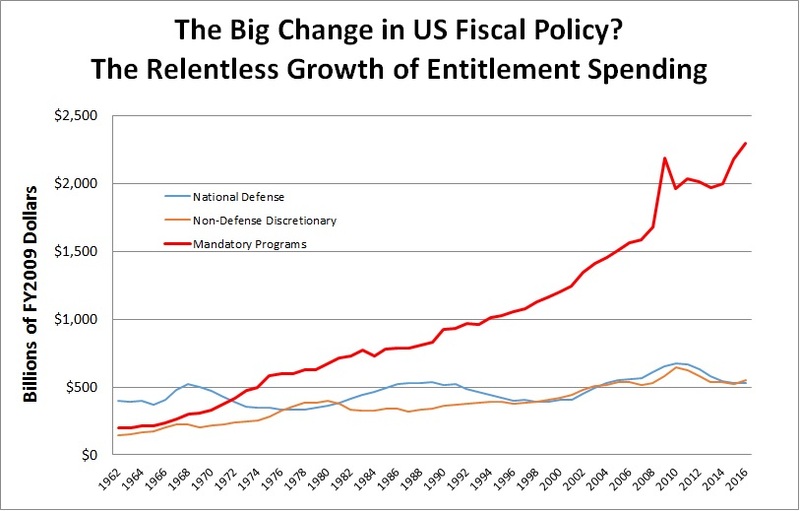 But what’s obviously driving fiscal policy is the relentless expansion of entitlements (referred to as “mandatory spending” for purposes of the Budget Enforcement Act). And because of demographic changes and bad policy choices, outlays for entitlement are projected to become a much larger burden in the future. So now, perhaps, you understand why I keep arguing in favor of genuine entitlement reform and why I think it’s so critical that Donald Trump reconsider his skepticism. P.S. In addition to George Will and Mark Steyn, Barack Obama also expressed some support for a libertarian-oriented foreign policy. But only in theory, not in practice. P.P.S. To put America’s military spending in global context, check out this pie chart. There are several features of President-Elect Trump’s tax plan that are worthy of praise, including death tax repeal, expensing, and lower marginal tax rates on households. But the policy that probably deserves the most attention is Trump’s embrace of a 15 percent tax rate for business. What makes this policy so attractive – and vitally important – is that the rest of the world has been in a race to reduce corporate tax burdens. Ironically, the U.S. helped start the race by cutting the corporate tax rate as part of the 1986 Tax Reform Act. But ever since then, policy in America has stagnated while other developed nations are engaged in a virtuous contest to become more competitive. And that race continues every day. Most impressively, as reported by the Financial Times, Hungary will cut its corporate tax rate from 19 percent to 9 percent. Hungary’s government is to cut its corporate tax rate to the lowest level in the EU in a sign of increasingly competitive tax practices among countries seeking to lure foreign direct investment. Prime Minister Viktor Orban said a new 9 per cent corporate tax rate would be introduced in 2017, significantly lower than Ireland’s 12.5 per cent. …The government said the new single band would apply to all businesses. “Corporation tax will be lowered to single digits next year: a rate of 9 per cent will apply equally to small and medium-sized enterprises and large corporations,” a statement said. …Gabor Bekes, senior research fellow at Hungary’s Institute of Economics…said the measure would likely provoke complaints of unfair tax competition from western capitals. Needless to say, complaints from Paris, Rome, and Berlin would be a sign that Hungary is doing the right thing. Croatia also is moving policy in the right direction, albeit in a less aggressive fashion. Corporate income tax will…be cut from 20 to 18 per cent for large companies and from 20 to 12 per cent for small and mid-level companies whose income is no higher than 400,000 euros annually. Though the Croatian government also plans to lower tax rates on households. Before the reform, people with salaries between 300 and 1,750 euros a month were taxed at 25 per cent, while now everyone earning up to 2,325 euros a month will be taxed at a 24 per cent rate. People earning more than 2,325 euros a month will have a 36 per cent tax rate, replacing a 40 per cent tax rate for anyone earning over 1,750 euros a month. But let’s keep the focus on business taxation. Our friends on the left don’t like Trump’s plan for a corporate tax cut, but here are there things they should know. A lower corporate tax rate won’t necessarily reduce corporate tax revenue, particularly over time as there’s more investment and job creation. A lower corporate tax rate will dramatically – if not completely – eliminate any incentive for American companies to engage in inversions. A lower corporate tax rate will boost workers wages by increasing the nation’s capital stock and thus improving productivity. If you want more information, here’s my primer on corporate taxation. You can also watch this video. Or, to make matters simple, we can just copy Estonia, which has the world’s best system according to the Tax Foundation.